Since they were founded by Pietro Valoriani in 1890 in the Florentine suburb of Figline Valdano who started producing jars, vases and bricks from refractory “Cotto Clay” – coveted Forni Valoriani refractory clay static and mobile wood and gas fired ovens continue to lead the way globally in clay oven design and manufacture. Still very much an artisan producer known all over the world, Forni Valoriani prides itself in creating innovative, well designed, functional and quality ovens to stand the test of time. 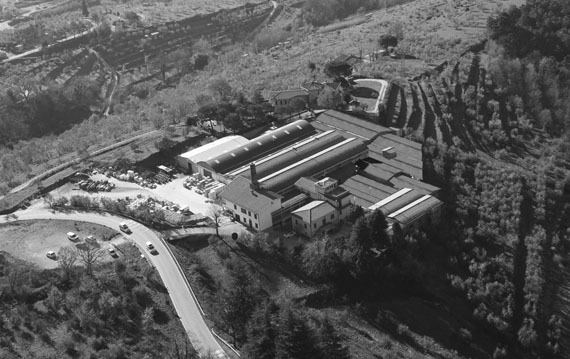 Pietros’ son Gino Valoriani in order to keep up with demand in improving and increasing production moved the factory to Reggello a rich clayish area some 20km from Florence. Less than a century ago many European communities still relied upon large communal wood fired ovens for their cooking needs, often with entire villages using the oven. Each day would begin with breads being made and ended with roasts and vegetables being cooked in them. Gino’s son Silvio had a eureka moment – “why don’t we build our own ovens?” Easier said than done.! Silvio went on to design and build the first prefabricated wood fired oven, taking advantage of the secular experience of the family in the choice of raw materials and defining the structural design of the vault, perfect in all its’ proportions. As a manufacturer of bricks Forni Valoriani was well positioned to help the Italian nation restore and rebuild thousands of new ovens in old and new homes to make bread during and after World War 2. Sylvio Valoriani was commissioned by the Italian Government to design an oven that could be made and assembled quickly for communities to replace their destroyed ovens. His solution was to produce prefabricated family sized ovens hand made from refractory clay quarried from the hills of Tuscany. The newly designed ovens were far more fuel efficient, had great heat retention and were easily and quickly assembled. Sylvio Valoriani patented his unique design in 1945 and is still to this day recognised as the original Italian wood fired oven. During the 1960’s Valoriani again adapted to the trend at the time as Italian eating habits were changing, this was mainly down to greater disposable income that allowed people to eat out more frequently. The Valoriani response was to create a range of prefabricated wood fired ovens called Vesuvio made exclusively for professional use. In response to great demand at home and abroad Forni Valoriani set up its’ own commercial and distribution network. Today Valoriani ovens are still hand crafted in Refrattari Reggello, high in the hills of Tuscany. Valoriani prides itself on not compromising quality for price, but by manufacturing ovens with proven longevity in being in daily in use after 30 years. Key reasons for the longevity of Valoriani ovens is down to the manufacturing process and using refractory clay for both the vault and oven floors. Forni Valoriani developed “The Verace” the first gas fired pizza oven globally accredited by Associazione Verace Pizza Napoletana [AVPN] to enable the creation of an authentic Neapolitan pizza. Valoriani tested and ruled out “Micro-Mesh” technology as they found the clay disintegrated far faster than even cement only ovens and often released unsafe particles into the oven chamber and food. All Valoriani ovens are manufactured from refractory clay only and tested to be 100% food safe and carbon neutral when used in accordance with the manufacturer’s instructions. Forni Valoriani are quite pragmatic about competitors attempting to copy their products and take it as a compliment, knowing full well that their ovens have been the catalyst and therefore responsible for the emergence of many competitors who do not have the lineage, heritage and expertise to manufacture like they do. Now in the hands of the 4th and 5th generation the success of Forni Valoriani has been down to each generation adapting to trends and customer needs at the time. Today Forni Valoriani is headed up by Pietros’ great grandson Massimo and great-great-grand daughter Viola who looks after export markets across all continents.